As a young man, William Branham found it very diffcult to fit in with the other young people his age. His nature, attitude and overall outlook on life was so vastly different from that of his peers. He loved hunting and fishing, but the others were more interested in smoking, drinking and dancing. Still, young William had desire to marry and raise a family. The possibility seemed to become more and more remote as he grew older. But God had already reserved a young woman by the name of Hope Brumbach for him. "Later on I found a girl when I was about twenty-two years old, she was a darling. She was a girl that went to church, German Lutheran. Her name was Brumbach, B-r-u-m-b-a-c-h, come from the name of Brumbaugh. And she was a nice girl. She didn't smoke or drink, or dance or anything, a nice girl. I went with her for a little while, and I was then about twenty-two. I had made enough money till I bought me an old Ford, and I... we'd go out on dates together. And so, that time, there was no Lutheran Church close, they had moved from Howard Park up there. And so there was a minister, the one that ordained me in the Missionary Baptist Church, Doctor Roy Davis. He had the Missionary Baptist Church at Jeffersonville. And he was preaching at the place at that time, and we would go to church at night, and we'd come back. And I never did join church, but I just liked to go with her. Because the main thought was "going with her," I just might as well be honest. So then going with her - She was out of a nice family, And I begin to think, "You know, I oughtn't to take that girl's time. It isn't right, because she's a nice girl, and I'm poor." My daddy had broke down in health - There wasn't no way for me to make a living for a girl like that, who had been used to a nice home and rugs on the floor. I remember the first rug I ever seen, I didn't know what it was. I walked around the side. I thought it was the prettiest thing I ever seen in my life. "How would they put something like that on the floor?" It was the first rug I had ever seen. It was one of these - I believe it's called "matting rugs." I may have that wrong. Some kind of like "wicker" or something that's laced together, and laying on the floor. Pretty green and red, and big rows worked in the middle of it, you know. It was a pretty thing. And so I remember I made up my mind that I either had to ask her to marry me, or I must get away and let some good man marry her, somebody that would be good to her, could make her a living and could be kind to her. I could be kind to her, but I was only making twenty cents an hour. So I couldn't make too much of a living for her. And with all the family we had to take care of, and Dad broke down in health, and I had to take care of all them, so I was having a pretty rough time. So So I thought, "Well, the only thing for me to do is tell her that I just won't be back, because I thought too much of her to wreck her life and to let her fool along with me." And then I thought, "If somebody could get a hold of her and marry her, make a lovely home. And maybe if I couldn't have her, I could know that she was happy." And so I thought, "But I just can't give her up!" And I was in an awful shape. And day after day I'd think about it. So I was to bashful to ask her to marry me. Every night I'd make up my mind, "I'm going to ask her." And, why, what is that, butterflies, or something you get in your stomach. All you brethren out there probably had the same experience along that. And a real funny feeling, my face would get hot. I didn't know. I couldn't ask her. So I guess you wonder how I ever got married. You know what? I wrote her a letter and asked her. Now, it wasn't "dear Miss," it was a little more (you know) on the love side than that. It was just not an agreement - I wrote it up the best I could. And I was a little afraid of her mother. Her mother - she was kind of rough. And, but her father was a gentle old Dutchman, just a fine old fellow. He was an organizer of the brotherhood and trainmen on the railroad, making about five hundred dollars a month in them times. And me making twenty cents an hour, to marry his daughter. Uh! I knowed that would never work. And her mother was very - Now, she's a nice lady. And she was kind of one of these high societies, you know, and prissy like, you know, and so she didn't have much use for me anyhow. I was just an old plain sassafras country boy, and she thought Hope ought to go with a little better class of boy, and I think she was right. But I didn't think it then. So, So I thought, "Well, now, I don't know how. I can't ask her daddy, and I'm sure not going to ask her mother. And so I got to ask her first." So I wrote me a letter. And that morning on the road to work, I dropped it in the mailbox. We was going to church Wednesday night, and that was on Monday morning. I tried all day Sunday to tell her that I wanted to get married, and I just couldn't get up enough nerve. So then I dropped it in the mailbox. And on at work that day I happened to think, "What if her mother got a hold of that letter?" Oh, my! Then I knowed I was ruined if she ever got a hold of it, 'cause she didn't care too much about me. Well, I was just sweating it out. And that Wednesday night when I come, oh, my, I thought, "How am I going to go up there? If her mother got a hold of that letter she will really work me over, so I hope she got it." I addressed it to "Hope." That was her name, Hope. And so I said, "I will just write it out here to Hope." And I thought maybe she might have not a-got a hold of it. So I knowed better than to stop outside and blow the horn for her to come out. Oh, my! And any boy that hasn't got nerve enough to walk up to the house and knock on the door and ask for the girl, ain't got no business being out with her anyhow. That's exactly right. That's so silly. That's cheap. And so I stopped my old Ford, you know, and I had it all shined up. And so I went up and knocked at the door. Mercy, her mother come to the door! I couldn't hardly catch my breath, I said, "How--how--how do you do, Mrs. Brumbach?" Yeah. And she said, "Will you step in?" And just then here come Hope skipping through the house, just a girl about sixteen. And she said, "Hi, Billy!" And I said, "Hi, Hope." And I said, "You about ready for church?" I thought, "Oh, my! She never got it. She never got it. Good, good, good. Hope never got it either, so it'll be all right, 'cause she'd have named it to me." So I felt pretty fair. And then when I got out of church, I happened to think, "What if she did get it?" See? And I couldn't hear what Doctor Davis was saying. I looked over at her, and I thought, "If maybe she's just holding it back, and she's really going to tell me off when I get out of here, for asking her that." And I couldn't hear what Brother Davis was saying. And I'd look over at her, and I thought, "My, I hate to give her up, but the showdown's sure to come." So after church we started walking down the street together, going home, and so we walked to the old Ford. And so all along the moon is shining bright, you know, I look over and she was pretty. Boy, I'd look at her, and I thought, "My, how I would like to have her, but guess I can't." And so I walked on a little farther, you know, and I'd look up at her again. I said, "How you feeling tonight?" And we stopped the old Ford down and we started to get out, you know, around the side, walk around the corner and go up to her house. And I was walking up to the door with her. I thought, "You know, she probably never got the letter, so I just might as well forget it. I will have another week of grace anyhow." So I got to feeling pretty good. She said, "I got your letter." Oh, my! I thought, "Woman, tell me something. Run me away or tell me what you think about it." And I said, "Did you read it?" My, you know how a woman can keep you in suspense. Oh, I didn't mean it just that way, you see. See? But, anyhow, you know, I thought, "Why don't you say something?" See, and I kept going on. I said, "Did you read it all?" So we was almost to the door, and I thought, "Boy, don't get me on the porch, 'cause I might not be able to outrun them, so you tell me now." And so I kept waiting. And she said, "Billy, I would love to do that." She said, "I love you." God bless her soul now, she's in Glory. She said, "I love you." Said, "I think we ought to tell our parent, the parents about it. Don't you think so?" And I said, "Honey, listen, let's start this out with a fifty-fifty proposition." I said, "I will tell your daddy if you'll tell your mother." Rooting the worse part off on her, to begin with. I said, "All right, I will tell him Sunday night." And so Sunday night come, I brought her home from church and I... She kept looking at me. And I looked, and it was nine-thirty, it was time for me to get going. So Charlie was sitting at his desk, typing away. And Mrs. Brumbach sitting over the corner, doing some kind of a crocheting, you know, or them little hooks you put over things, you know. I don't know what you call it. And so she was doing some of that kind of stuff. And Hope kept looking at me, and she'd frown at me, you know, motion to her daddy. Oh, my! I thought, "What if he says, `No'?" So I started out to the door, I said, "Well, I guess I'd better go." And I walked to the door, and she started over to the door with me. She'd always come to the door and tell me "good night." So I started to the door, and she said, "Aren't you going to tell him?" And I said, "I'm sure trying to, but I don't know how I'm a-going to do it." And she said, "I will just go back and you call him out." So she walked back and left me standing there. And I said, "Charlie, Could I talk to you just a minute?"" And he said, "Yes, I will come out." So he walked out on the porch. He looked at me and said: "Certainly has." I said, "I've been working so hard," I said, "you know, even my hands is getting calluses." He said, "You can have her, Bill." Oh, my! "You can have her." I thought, "Oh, that's better." I said, "You really mean it, Charlie?" I said, "Charlie, look, I know that she's your daughter, and you got money." And he reached over and got me by the hand. He said, "Bill, listen, money ain't all things that's in human life." I said, "Charlie, I only make twenty cents an hour, but I love her and she loves me. And I promise you, Charlie, that I will work till these calluses wear off of my hands, to make her a living. I will be just as true to her as I could be." So, when we got married, we didn't have nothing, nothing to go housekeeping. I think we had two or three dollars. So we rented a house, it cost us four dollars a month. It was a little, old two-room place. And someone give us an old folding bed. I wonder if anybody ever seen an old folding bed? And they gave us that. And I went down to Sears and Roebucks and got a little table with four chairs, and it wasn't painted, you know, and we got that on time. And so then I went over to Mr. Weber, a junk dealer, and bought a cooking stove. I paid seventy-five cents for it, and a dollar and something for grates to go in it. We set up housekeeping. I remember taking and painting a shamrock on the chairs, when I painted them. And, oh, we were happy, though. We had one another, so that was all necessary. And God, by His mercy and His goodness, we was the happiest little couple could be on the earth. I found this, that happiness does not consist of how much of the world's goods you own, but how contented you are with the portion that's allotted to you. 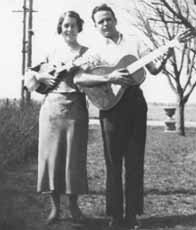 On Friday June 22, 1934, William Branham and Hope Brumbach were married. He was a fledgling preacher of twenty-five and his beloved Bride was not quite twenty-one. And a happy marriage it was for as long as it lasted. Little did they realize how short it would be. We will consider this in another of the Highlights of the prophet's life.